You can share the examples in the Read the Group Indicator in Posts section with your learners. The Participating in Course Discussions section in the Open edX Learner’s Guide also provides useful information to help learners make the most of their participation in course discussions. Course team members who have the discussion admin, discussion moderator, or community TA role see the same indicator of who can read each post. Unlike the learners, however, team members with discussion privileges can read and contribute to every post, regardless of the group membership of the learner who posted it. Course team members must have the discussion moderator or discussion admin role in addition to the Staff or Admin role to be able to view posts that are divided by group. For information about assigning discussion moderation roles, see Assign Discussion Administration Roles. Learners who have the Community TA role can read and contribute to all posts. 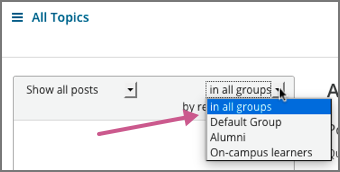 In courses where either cohorts or multiple enrollment tracks are enabled, course team members who have discussion moderator or admin privileges can also perform the following actions. All of the other options and features described in the Managing Course Discussions section continue to be available to the discussion moderation team. 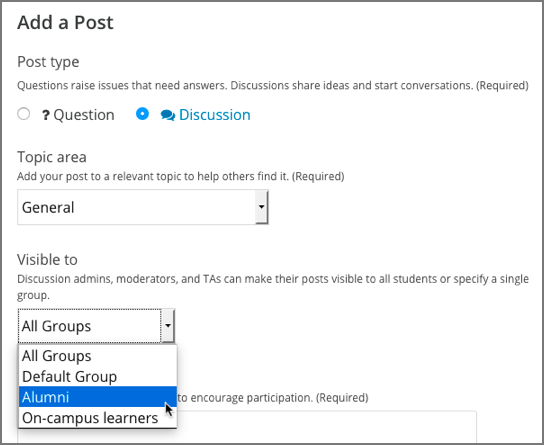 If you have the discussion admin, discussion moderator, or community TA role, you can make posts to divided discussion topics visible to everyone who is enrolled in the course or only to the members of a specified group. When you add a post, the Visible to dropdown list appears above the Title field. As a discussion team member, you can choose the visibility of your posts in topics that are divided. This means that you can add a single post with information that you want everyone to see, rather than having to write a separate post for each group. It also means that it is possible for you to unintentionally share information with a different audience than you intended. Learners do not choose the visibility of their posts. The visibility of learner posts is determined by the configuration of the topic they post in. See Identifying Who Can Read a Post. Course team members must have discussion moderator or admin privileges in addition to their course team privileges to be able to view and filter posts that are divided. For other options that you can use to view posts, see Moderate Discussions.